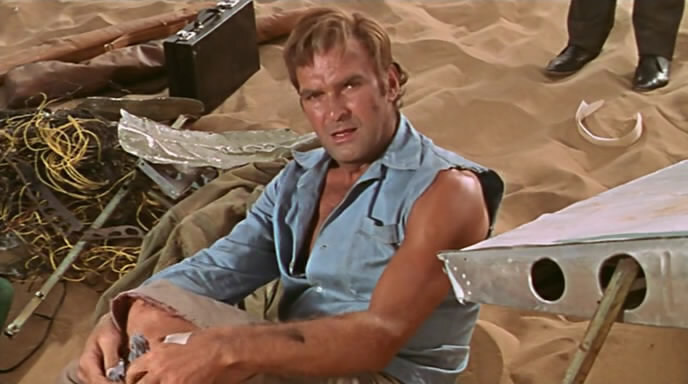 The team who put together the 1963 winner Zulu once again joined forces for a slightly different story of man’s struggle to survive in Africa when a private plane carrying a handful of passengers goes down in a deserted area of the Kalahari. It’s not just the elements that will prove to be dangerous to their livelihood. Mogul Joseph E. Levine, director Cy Endfield and actor/producer Stanley Baker lead the way in this tightly knit thriller that sees Baker playing a slightly lesser role than one might expect. In a great opening shot from Endfield a passenger plane lands enroute to Johannesburg. With the next leg of the journey delayed, the travelers are put up in a local hotel which allows introductions to our cast of characters. Baker seems to be a happy go lucky drinker, Susannah York an enticing blonde, Theodore Bikel a heavy set Doctor and Harry Andrews an aging man of German descent. Securing a private plane to carry on the journey with Nigel Davenport piloting, the quartet agree to finance the flight and as they’re leaving a fifth man joins in, Stuart Whitman who appears to be a big game hunter with the rifles to show for it. On the journey the plane will encounter far too many locusts for me to keep count but with both engines clogged and the windshield covered in god knows what, the plane goes down leaving Davenport’s co-pilot dead and Baker’s leg badly injured. With the plane bursting into flames it’s a harrowing scene as each star player evacuates with Whitman and his survival tactics the last to exit as he makes a play for the rifles just as the plane erupts into a fireball of an explosion. With little water and nothing but dunes in sight, the walk begins with Baker being helped along. The group actually find a habitable cliff side with water and fruits to eat but it’s the internal struggles in a Lord of The Flies type of setting that will slowly become their undoing. It’s Davenport who sets out in search of help and his plight will come and go in our story while the main thrust of the plot takes place at the cliff side caves where the remaining cast members attempt to get along. Water and food isn’t the problem. 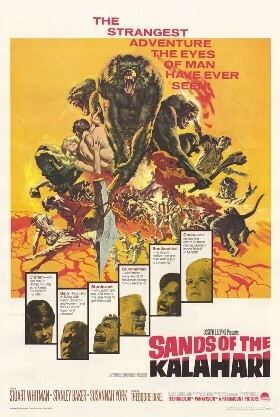 It’s four men and a female with Stuart Whitman beginning to mirror the baboons that scurry around the rocky ridge laying claim to their territory. He wants to be the ruler of their new domain and claim the female for himself. Not only that but he sees most everything as a competitor in staying alive. Both the baboons and his fellow man. 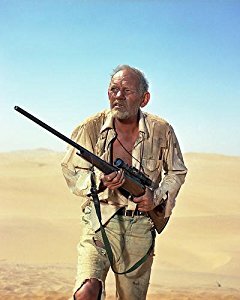 It’s quickly turning into a survival of the fittest contest and the shirtless Whitman running amok with a rifle in his hand seems up to the task. Considering actors Bikel and Andrews aren’t exactly up to the challenge, it’s more than obvious that it’s going to be Whitman vs. Baker at the finish line. The Prize? York perhaps but definitely to go on living. Well filmed including some great shots of Davenport in the dunes, this is a stirring adventure at times with a strong performance by Whitman as the protagonist. Funny thing is if I had a chance to talk to Stanley Baker about the film I’d point out that I like it very much and thought Whitman was great in it. Then I’d promptly ask him how come he didn’t play the role himself? It seems like a tailor made role for Baker yet he winds up taking on a role that for the first 40 minutes barely sees him score any screen time and the vast majority of what he does get is as a somewhat meek character. According to the IMDB, Whitman and Baker actually swapped roles and for a look at some of the actors who nearly appeared in the production, have a look at the trivia here from IMDB. I’m reminded of a couple films while watching this one. Flight of the Phoenix which was released the following year with an all star cast facing death in the desert and interestingly enough, Planet of the Apes for a few reasons. When the group sets out across the desert leaving the burned up plane behind, the sun scorching them and the music eerily echoing the score of the Apes film when Heston and his two fellow astronauts set out in search of life on their new home. To be sure I wasn’t imagining this, I called in number one son Ethan and played the sixty second clip and asked him what it may remind him of. Without any prodding from me, he said the Apes. There’s even a comment made about “baboons with guns” in reference to their newfound mates in the cliff side caves. In reality, that planet was still three years in the future for movie goers. Just in case I haven’t mentioned it previously on some other “take” over the past three plus years, I’d like to tip my hat towards the great Harry Andrews. A credit to most any production he was ever involved in and most certainly is here with a fine performance as an elderly, wise man who can see the demons circling the survivors. I first saw this film ages ago and while I don’t think I really knew who Stanley Baker was at the time, it stayed with me and when Olive Films put it out on DVD a few years ago I secured a copy to add to the shelf here at home and enjoy it once again. Now if I could just secure a copy of this awesome one sheet for the vault here at home. Great film about surviving the elements. It’s interesting how they essentially revert to cavemen type behaviour and all try and get the woman as their own. Good performances throughout. Agreed which is why I liked Harry Andrews so much in this one, he could see it coming and of course he’s right as Whitman descends into madness. A worthy addition to the pile.